(NaturalNews) The Chinese government has temporarily halted the administration of a sexually-transmitted disease (STD) vaccine for newborn babies following the horrific deaths of eight infants over the past several months. Reports out of Shanghai indicate that millions of doses of hepatitis B vaccine produced by the Chinese pharmaceutical company Shenzhen Kangtai Biological have been suspended while health authorities investigate why the children died. According to WA Today, government inspectors have been sent to the company's manufacturing facilities to look for clues, while a second drug maker, Beijing Tiantan Biological Products, is also being investigated for vaccines that may have resulted in two of the deaths. But the primary focus is on Shenzhen Kangtai, which was formed in 1992 with the help of both the Chinese government and U.S. drug giant Merck & Co., manufacturer of the detestable Gardasil vaccine for HPV that has injured and killed thousands of young girls. Merck reportedly helped fund the initial construction of Shenzhen's manufacturing facility, and also gave the company the biological technology to manufacture hepatitis B vaccines without having to pay royalties. Deviating from the norm by which drug companies typically conduct business with one another, Merck entered into an unusual joint venture agreement with Shenzhen that allowed it to manufacture hepatitis B vaccine without having to pay royalties. The reason, claims the report, was simply to help China improve its health standards at a time when some two million Chinese children were allegedly being infected with hepatitis B every year. What is Merck gaining by supplying 'free' STD vaccines to China? We all know that vaccine companies are unscrupulous when it comes to making money, so there is certainly more to this story than just benevolence in the interest of public health. As admitted by WA Today, China appears to be allowing U.S. drug companies vauable access to the growing Chinese consumer market in exchange for vaccine rights. 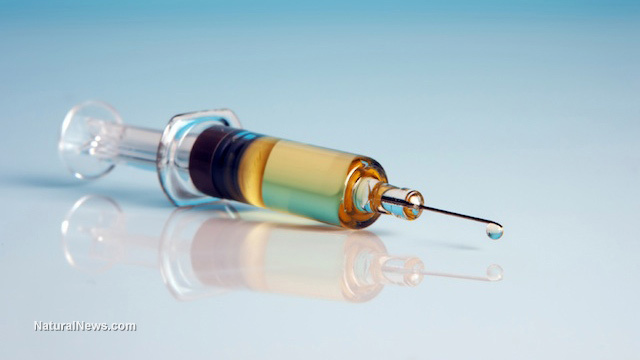 Shenzhen currently holds a 60 percent market share on hepatitis B vaccine production in China, with a soon-to-be developed, multi-million dollar research, development, and manufacturing center set to be built in the city of Shenzhen. This facility will presumably manufacture more hepatitis B vaccines that, according to The New York Times (NYT), contains genetically-modified (GM) ingredients. Buried deep within the NYT archives is an article explaining that in exchange for the "free" hepatitis B vaccine, Merck received special payments to help fund "plant start-ups and training." In other words, Merck did receive kickbacks in exchange for providing China with a toxic vaccine that is poisoning and killing its babies. This isn't the first time that Merck's recombinant vaccine for hepatitis B has killed children. In a separate incident reported in late 2013, at least 11 children died from the same vaccine manufactured by a different company, Dalian Hissen BioPharm Inc. Hepatitis B vaccines manufactured by this, and several other companies, remain in use despite their potential to kill children. "Since 2000, there have been 188 deaths after hepatitis B inoculation in China," stated Wang Huaqing, a public health official with the Chinese Centers for Disease Control and Prevention's National Immunization Program, following this earlier set of deaths. Combined with the latest hepatitis B vaccine deaths, this number is now nearly 200.